A recent phase 3 randomized, double-blind, placebo-controlled study (J Panes et al. 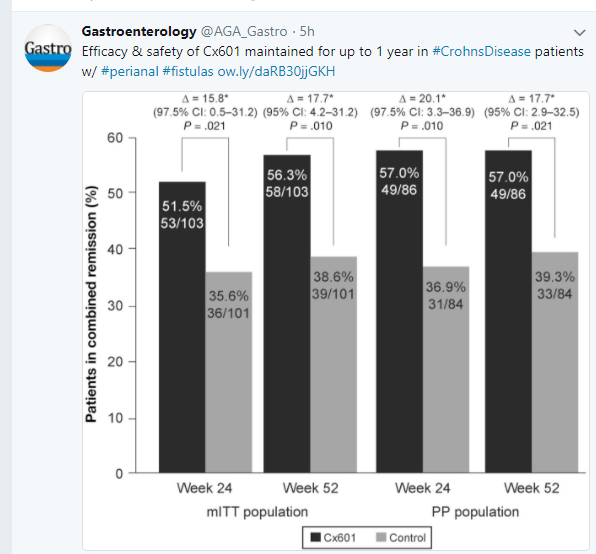 Gastroenterol 2018; 154: 1334-42) examined the use of stem cell therapy for the treatment of complex perianal fistulas in Crohn’s disease (CD). They used a single local injection of 120 million Cx601, a suspension of allogeneic expanded adipose-derived stem cells, and compared to a placebo injection. This study comprised 212 patients from 49 centers. The primary endpoint, labelled “combined remission,” was based on absence of draining fistulas and MRI findings. My take: This local therapy improved outcomes for 1 year after a single injection and appears promising for refractory perianal fistulas. It may help avoid surgery or systemic immunosuppression. This entry was posted in inflammatory bowel disease and tagged Crohn's disease, fistula, perianal disease by gutsandgrowth. Bookmark the permalink.